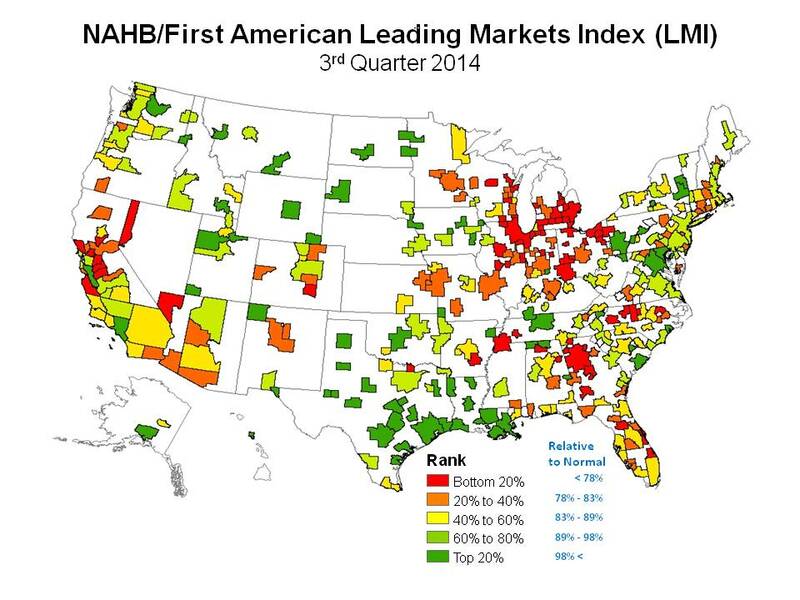 The economy and the housing market continue their gradual march back to normal as measured by the NAHB/First American Leading Markets Index (LMI). The index measures how close every metropolitan area is to their last normal level of single-family housing permits, employment and house prices. At the national level, the index rose to .90 in the third quarter from .89 in the second quarter. The LMI has three components and two of them were responsible for the increase. The single-family permit index rose from .43 to .44 meaning total permits issued in the past three months were at 44 percent of the last normal period, which was 2000-20003. Home prices also rose to 1.3 from 1.27, which means house prices are 30 percent higher than the average in 2000-2003. Employment was the only component that did not change; remaining at .95 which means the last 12 months average employment was at 95% of the peak employment levels of 2007. Of the 350 metro areas with their own LMI, 59 have a value at or over 1 meaning they have recovered and moved on from their last normal state. Seven metro areas were added to this list in the last year. 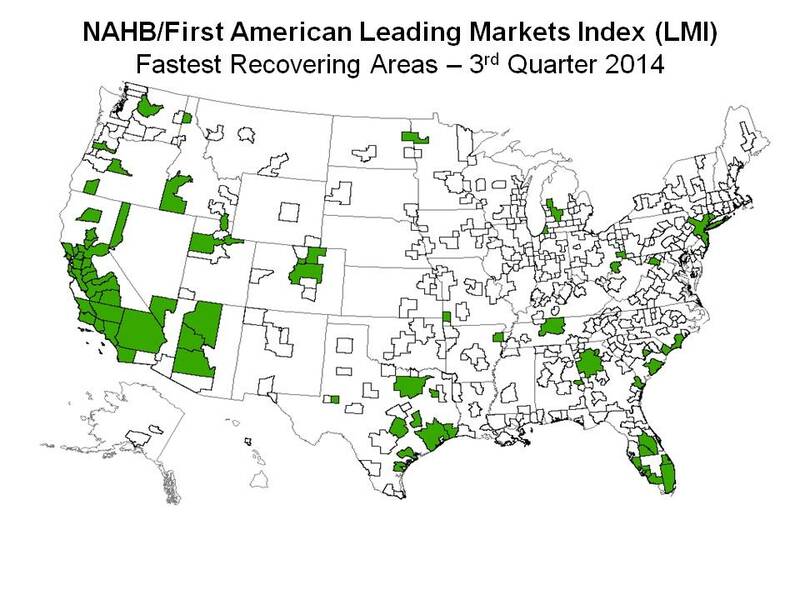 The recovered markets are dominated by energy producing areas with 15 in Texas, 8 in Louisiana and 3 in North Dakota. Smaller metro areas with universities or military bases have also done well. The change can be viewed in two ways. Progress toward normality depends on the speed of the recovery but also the length of the trip. Markets that sunk the most are moving forward but the collapse was so large, it will take some time for complete recovery to take place. The map below shows five segments of the LMI from those markets beginning with the darkest green that are 98% or better toward normal down to the darkest red that are still less than 78% of the way back to normal. The second map below shows those markets that are improving the fastest and many of them are at the lower end of the spectrum in the previous map. These green shaded areas are often coming from the lower ranks and faster pace is partly due to the low base from where they started.